NjiaUK is an International Student Recruitment Agency acting on behalf of potential students from East Africa – Burundi, Kenya, Rwanda, Tanzania & Uganda. Free and professional, NjiaUK specialises in placing students on courses at Salford University in the United Kingdom. The company runs a no-cost service to the student; claiming a proportion of the fee from the destination University on successful registration to the course. The United Kingdom is a world leader in Higher Education that gives students a top quality degree of the highest standard. Studying in the United Kingdom also provides a multitude of opportunities to study and embrace life in a truly multicultural environment. The University of Salford in the United Kingdom offer globally recognized qualifications, which will not only prepare you for a career in your chosen subject, but develop your skills and employability in the global market place. 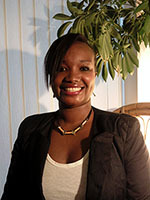 "My name is Benigne Ntamba, I was born in Burundi and decided to study in the UK at the age of 22. I graduated from The University of Salford having completed an International Foundation Year at the University of Bolton. I continued my Post Graduate studies in Interpreting and Translation and decided to establish NjiaUK to help develop the potential for students from Africa to study in the UK."